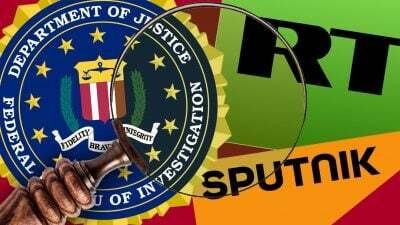 The latest US hostile action against Russia requires a company providing services for RT America to register under the Foreign Agents Registration Act (FARA), along with an FBI probe of Sputnik News to check for FARA violations. Enacted in 1938 one year before WW II began, it requires agents representing foreign powers politically or quasi-politically to disclose their relationship with other governments, along with information about their activities and finances. From 1938 until amended in 1966, enforcement focused on foreign propagandists, during WW II used in 23 criminal cases, the last time America had an enemy, none since then except invented ones to justify unjustifiable imperial wars. Since 1966, FARA focused on foreign lobbying instead of propaganda. From then to now, no one was convicted of violating the law. In 1995, the term “political propaganda” was removed from removed from its text. FARA was created to target foreign agents and lobbyists as amended, not media operations. Targeting RT America through its services supplier and Sputnik News violates the letter and spirit of the law, perhaps prelude to censoring, then banning both operations in America. Earlier this year, congressional legislation called the Agents Registration Modernization and Enforcement Act was introduced, aiming to broaden FARA’s scope with RT and Sputnik News in mind. The same goes for RT. FARA was never intended to censor or interfere with media operations. It targeted Axis propagandists, the law a relic of that time, out-of-line to use against legitimate Russian media. I’ve been interviewed by both operations. I’m a commentator, journalist, analyst, not a propagandist – nor are others like myself I personally know who’ve appeared on one or both networks. If RT and Sputnik News are censored, undermined or shut down, Moscow will no doubt respond in kind – in keeping with what Sergey Lavrov called “parity,” the criterion Washington established. Featured image is from The Daily Beast.